When my debut novel, The Maid’s Room, was published last week, I had a launch party at Waterstones, Richmond. On the way there, my mouth went a bit dry as I wondered what on earth I was doing. There were going to be 60 people there, and I had to do a speech – a prospect I wasn’t relishing. But as soon as I climbed the stairs to the cafe area in Waterstones, a curious calm took over. My books were piled everywhere. There were posters of my gorgeous cover, and all the tables were decorated with yellow roses. Then the guests started to arrive – my agent Rowan and other agents from Furniss Lawton, my parents, and lots of my friends. Even my former editor, affectionately known as ‘the best boss ever’ had schlepped all the way from West Sussex. Other people had made long journeys too – and I was so happy that they had. I mingled, gushed a lot, and smiled the kind of genuine smile that doesn’t give you face-ache. Thorne Ryan from Hodder & Stoughton did a great speech and talked about some of the plaudits The Maid’s Room has already won from magazines such as Grazia and Red. She even mentioned the ‘genuinely excellent’ that Heat magazine said of the book last week. Then it was time for my speech. I actually enjoyed standing there thanking all the people who have got me to this place, including my husband who has weathered the seemingly endless disappointments along the way. I read a short excerpt from my book, signed lots of books and had an all-round brilliant time. Afterwards some of us headed to a nearby pub, and ouch – yes, I did need the paracetamols the next morning. Thank you to everyone who came to my book launch – I enjoyed every second of it. Today I gave a talk to writers in Singapore via FaceTime and surprisingly, for someone who claims not to like public speaking all that much, I enjoyed it. Hooking up via a wonky Skype connection, then reverting to FaceTime, there were about fourteen writers in the room making notes while I talked about the long route from starting my very first novel to landing a two-book deal with Hodder & Stoughton. Publication of The Maid’s Room is now only six weeks away and I can’t wait. Hopefully I managed to relay some tips that the writers will find useful. The word ‘perseverance’ was uttered more than once. I took me three years, three months and 29 days from receiving my first agent rejection letter to getting representation from my lovely agent Rowan Lawton. During that time I became an expert in rejection, so a large part of my talk was dedicated to surviving the submissions process. Logging onto Paul McVeigh’s brilliant website to keep you going. There were so many times I snivelled over my keyboard as I read one of the author interviews featured to make myself feel just that little bit better about everything. Entering writing competitions. Being shortlisted in the Bristol Short Story Prize for the very first time buoyed me up. Some of the judges and authors who read my story liked my work and encouraged me to keep writing. Watching TED Talks. On the days I felt particularly low, I’d watched a Ted Talk. There’s so much to inspire you here, from writers talking about books, to people who’ve overcome enormous obstacles to achieve their personal bests. Using the anger. I did quite a bit of ranting about rejection, but then somehow I managed to turn that emotion into energy. Try it – you might just end up writing your soul onto the page. Preparing this talk was a real eye-opener for me. It took quite a few hours to plan what I wanted to say, so a big shout-out to inspirational teachers everywhere. I had no idea teaching involved so much hard graft. But the biggest revelation for me was just how much I loved doing a spot of public speaking – hopefully I’ll remember that in future. Huge thank you to author Alice Clark-Platts for inviting me to speak, and the Singapore Writers’ Group, thanks for listening. I spent the first half of last year being cross at my writing. It had taken me away from people and I was beginning to feel quite isolated. Then something started to change – my writing began to bring connection, people who I could really hear, people who energised me. It started when an agent put me in touch with an editor. Yeah, yeah – I know lots of us have been through this, and I was cynical but decided to take a leap of faith and pay for my novel to be edited. It was a wise choice. Editor, Sara Sarre, got my book, was enthusiastic about it. Her wisdom gave me a new spark. Suddenly I felt as if I wasn’t in this alone. And it was a magical moment in June when literary agent Rowan Lawton signed me. My face hurt, my smile was that wide. Writing has brought me new friends too. In November, I met up with a group of writers who I knew only through Twitter. I stood outside a restaurant in Covent Garden feeling nervous before I opened the door and sat down to lunch with seven complete strangers. It was one of the highlights of my year. Forget nothing conversations about the weather; here we talked openly about our fears, our hopes, our children. And oh how we laughed. For a long time, I’d wanted to meet gifted writer Joanna Campbell whose work I admire. In December, I got my chance at the launch of her short story collection When Planets Slip Their Tracks. Her nuggets of wisdom have stayed with me. As has her book – it is so well observed and funny and I am enjoying it immensely. I’m ending the year feeling grateful to my writing. It’s brought me some special personalities, people who have made my life better with their thoughts and funny asides. I’ll be holed up in the writer’s cave again throughout 2017, but I intend to make regular escapes to talk about it all. 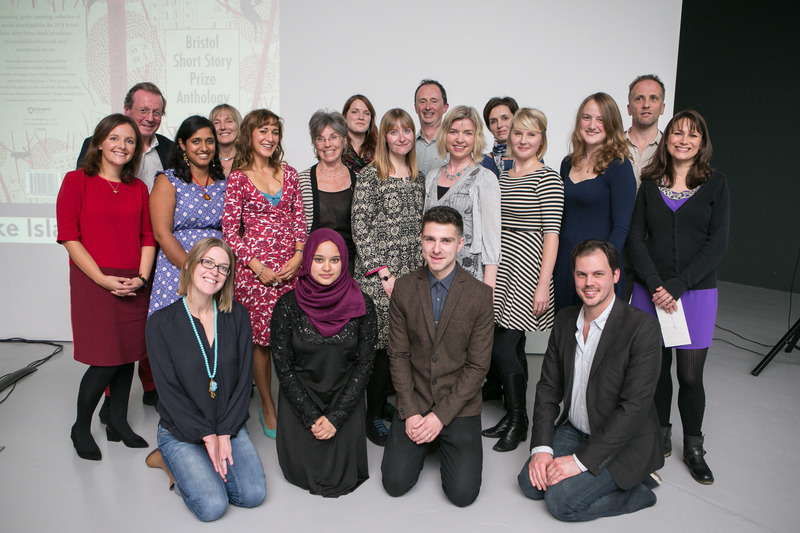 It was my second time at the Bristol Short Story Prize awards ceremony last night. I was hopeful; I was in with a chance after all, among 20 other writers chosen from almost 2,500 entries. There they were, faces I recognized from last year, organiser Joe Melia, judges Sara Davies and Sanjida O’Connell, and wasn’t that 2013 winner Paul McMichael over there? He’d made the shortlist again. I made a beeline for him and we began laughing in a slightly hysterical, scared kind of way. Still the fear was nothing on last year when – gulp – I could barely speak my mouth was that dry. 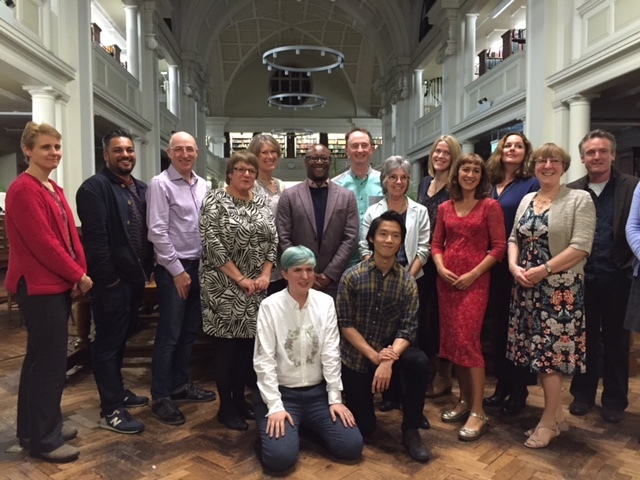 Us shortlistees sat in the front row in the glass-topped Reading Room at Bristol Central Library. And judge Sara Davies read out the names of the runners-up. Mine was among them. But so what – my story is in a book again – words that I’ve fussed over, changed and rearranged. A story that the early readers and the judges must have connected with somehow. It gets a mention in Sara Davies’ foreword. ‘We all liked….the restrained and powerful exploration of an illegal immigrant’s emotional trauma at the heart of Black Lines,’ she writes. It was a good feeling reading that. I hope other readers connect with my story too. Massive congratulations to Brent van Staalduinen whose story A Week on the Water won first prize, and to the other prizewinners too. After the ceremony, I spoke to the other shortlisted writers, smiles stretched across their faces, bags bulging with anthologies. (They make very good Christmas presents, let me tell you.) Wine was drunk, woes were shared and successes were well and truly celebrated. I even signed a few books. It was great to bend Joe Melia’s ear again. His encouragement last year helped steer me through a bout of writing self-doubt. When that strikes again, all I need to do is open up my brand new anthology and remind myself of the rewards for not being a quitter. Joe also told me that no one in the history of the Bristol Short Story Prize has ever managed a hat trick, so maybe, just maybe I’ll throw my hat into the ring again next year. I had no idea what I’d let myself in for when I accepted my invitation to the Bristol Prize Awards Ceremony. What would the atmosphere be like? Would we have to stand on a stage with shining spotlights turned off one by one until the winner was announced? Inside the vast space of Bristol’s Spike Island gallery last night, the air was fat with nerves – or maybe that was just me. I picked up a glass of wine from the table and hand aquiver, I just about baptized myself with Sauvignon Blanc. Bristol Prize co-ordinator Joe Melia talked us writers through what was about to happen. ‘This is all about celebrating your writing,’ he said. Some of the tension fell away. Here was a bunch of writers at different stages in their careers – a published novelist, a creative writing tutor and others who, like me, are just at the beginning. So much to talk about. Do you ask friends to read your work? Have you got an agent? And, and, and…. And then it was time for the show. Images of the stunning designs submitted for the anthology cover flashed onto the wall. The Mayor of Bristol stood up to speak, followed by novelist Patricia Ferguson. And then came the moment of judgement. Would my name be in the winning three? Hands white-tight on the side of the chair, breath held, the names of the runners up were read out. Three, four, five. I heard my name. I hadn’t won. Was I upset? Disappointed? No way – at last I could breathe again, high on my prize – my first ever piece of published fiction – The Colour of Mud. Big congratulations to winner Mahsuda Snaith and to all the other writers in the anthology. Didn’t we have some party?! The evening was a highlight of my year – inspiring chats with authors, an agent, and all the lovely people at the Bristol Prize.